A career as an Alaska flight attendant is fast-paced, responsibility-filled – and a lot of fun. 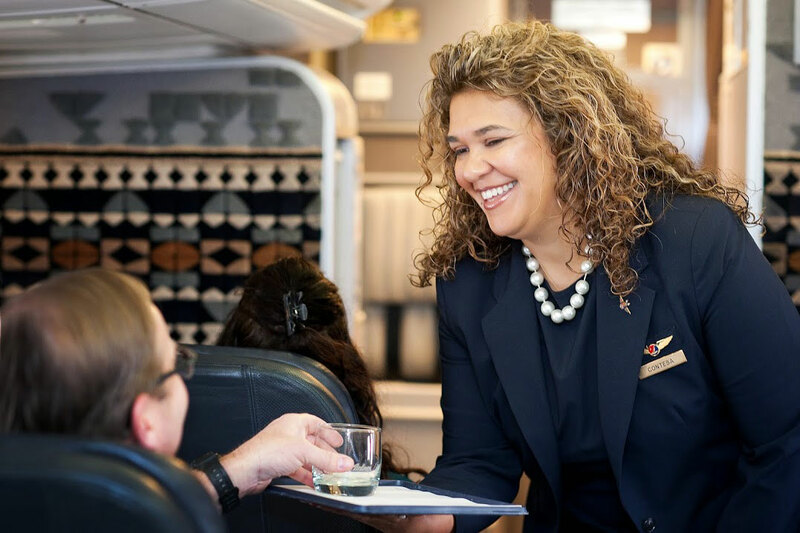 Delivering caring, extraordinary experiences, flight attendants pay attention to the little things that make our passengers’ days. Constant travel, a flexible schedule, meeting new people, and providing safe, comfortable, memorable journeys for customers make the life of a flight attendant endlessly exciting and rewarding. Flight attendants must project a professional, well-groomed image and be physically capable of performing all of their assigned duties. Applicants must be able to reach 80 vertical inches (approximately 5’2” in height). Trainees must be able to inflate and board an inflated slide as well as swim 90 feet to the slide wearing their life vest. A high school diploma or equivalent and 2 years customer / community service experience is required. Ability to read and converse fluently in English is required. Applicants must be able to prove U.S. citizenship or legal right to work in the United States, i.e., work visa, alien resident green card, social security card, driver’s license, and/or birth certificate. A background check will be completed for each applicant. Flight attendants are responsible for the service and safety of our passengers as well as creating a comfortable atmosphere. Duties include such things as food and beverage service, assisting passengers with baggage, assisting ill or disabled passengers, answering passenger inquiries and providing leadership and assistance during flight irregularities. All successful candidates will need to pass an FAA required drug screen. Flight attendants are required by the FAA to participate in a random drug-testing program. Alaska Airlines provides a 5-week tuition-free training program for each class of flight attendants. Successful completion is a prerequisite to be offered a position. Trainees receive an expense allowance of $280 per week during training. Depending on staffing needs, trainees can begin active service within days of successful completion of the program. It is the trainee’s responsibility to have a valid passport in hand by the first day of training. Upon successful completion of training, new graduates may be assigned to either Anchorage, AK; Seattle, WA, Portland, OR; Los Angeles, CA; or San Diego, CA depending upon Company needs. Flight attendants may bid to a preferred location once seniority level allows. Upon completion of the training program, flight attendants will be on reserve. The duration of their reserve status will be determined by their base seniority. The Association of Flight Attendants (AFA) represents Alaska Airlines flight attendants. A new flight attendant is guaranteed a base pay with a 90 flight hour credit guarantee per month. In addition to base pay, flight attendants receive per diem for each hour away from domicile, International pay for flying into and out of the U.S. excluding Canada, first position flight attendant pay, reserve premium pay, productivity premium pay, longevity premium pay, holiday pay and paid vacation. Flight attendants are eligible for health care benefits the first of the month following one month of service. The company offers a choice of medical plans which include dental and vision coverage, short-term disability and life insurance. Flight attendants are also eligible to participate in 401(k) and company-wide bonus programs such as Operational Performance Rewards and Performance Base Pay. Employees, their spouses, dependent children, parents, and a limited number of guests qualify for unlimited non-revenue space available travel benefits on Alaska Airlines and Horizon Air, as well as reduced fare rates (as outlined in company policy).